Doraemon as seen in the movie. Note the aforementioned English and Traditional Chinese subtitles. 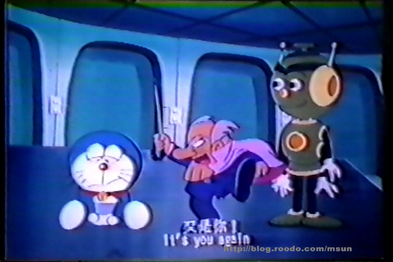 Doraemon: Robot War (小叮噹大戰機器人) is a 1983 bootleg Doraemon film created by Cuckoo's Nest Studio (now known as Wang Film Productions). The film was directed by Wang Ya Quan. The film was released in theaters on February 12, 1983, but it did poorly at the box office and was not released on home video. The plot of the film centers around a Robotics Exhibition in Taiwan where they are voting for the world's best robot. One professor who is really committed to developing the world's best robot had his spotlight suddenly stolen from him when Doraemon and Nobita entered the competition. Having been accidentally coerced into the competition, Doraemon used a wide variety of gadgets to defeat his opponents and ended up winning the World's Most Excellent Robot award. 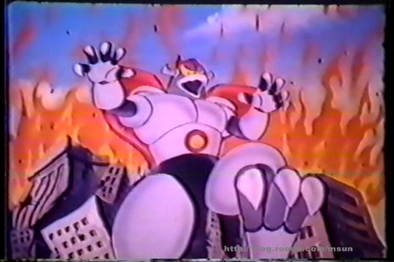 The professor is so frustrated by this that he begins to develop an evil robot to defeat Doraemon. 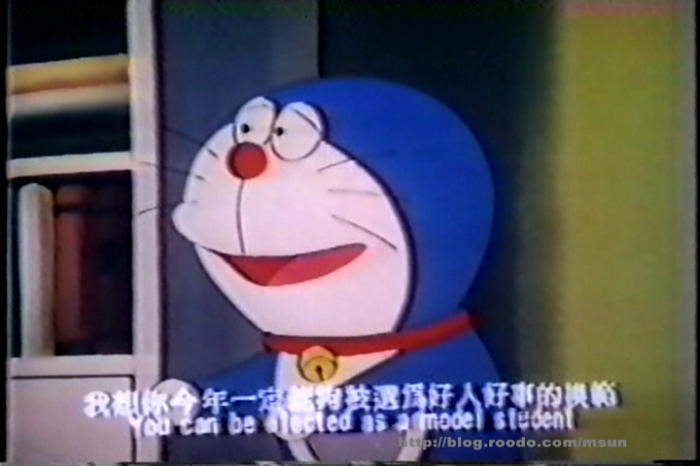 Meanwhile, Doraemon became a household name overnight and is now a big star. Wanting to become a star and experience the spotlight as well, Nobita uses a gadget to disguise himself as Doraemon. 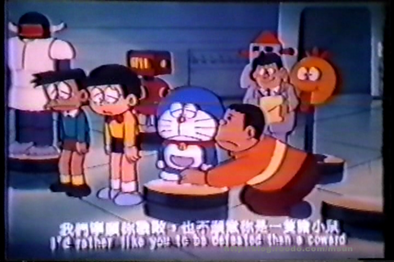 The result of this is that Nobita, disguised as Doraemon, ends up being abducted by the professor's evil robot. Once he learns of this, Doraemon immediately sets out to rescue Nobita. Meanwhile, the professor sends out an army of robots to carry out terrorist attacks all around the world. 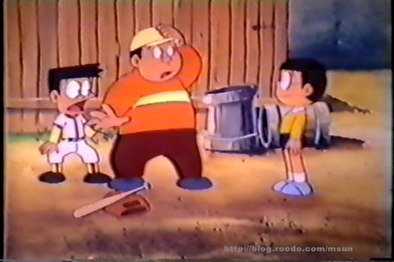 Eventually, Doraemon saves Nobita and manages to learn the weakness of the professor's robots, a fear of a certain type of gemstone. With this knowledge, Nobita and his friends are able to set out on an adventure, find the gemstone, and save the world. Wang Film Productions is an overseas animation outlet, originally created by James Wang for Hanna-Barbera. It has worked for, among lesser-known studios, Hanna-Barbera/Cartoon Network (Jetsons: the Movie, numerous Scooby-Doo specials), and Disney (Tron, The 7D, Phineas and Ferb movies, Goof Troop), as well as three episodes of Ren and Stimpy and thirty episodes of Tiny Toon Adventures. Unlike more amateurish companies such as Regal Studios or Wolf Tracer Studios, this is a "legitimate" production house that does legitimate animation work, which makes the fact that they made an unauthorized Doraemon film even stranger. Msun (the person who wrote the blog which hosted the existing images and posted a 30-second clip on Facebook), hasn't uploaded anything else from the movie and refuses to do so is because people keep "stealing" his videos and uploading them to YouTube, in combination to an incident when he first uploaded it where he was the only one to receive a takedown, apparently by Doraemon`s original company, which means this may actually be official, or at least officially recognized as a Doraemon film. When speaking to Msun, he said that his father bought his copy of the film at a DVD store. He also said that in the early 1980's, pirated recordings of movies were popular in Taiwan, meaning that if there is any chance of finding another copy, one would have to know either their way around Taiwan's pirated VHS stores or if someone else who does. Information on the film is extremely scarce, and the only proof of its existence is the few Chinese sites, containing several screenshots and one clip of ending footage from the film which was posted on Facebook in 2012. All footage of the film has English and Traditional Chinese subtitles - it is unknown why this was included in the release. An 'Animation Warehouse' episode about the film. An advertisement for the film. 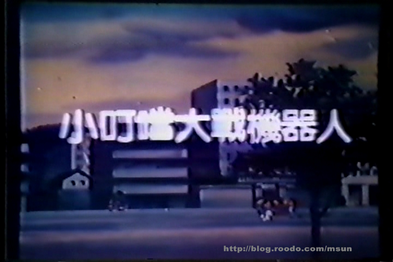 The film's title screen. Note that it is simply the title and not the logo as seen in the advert above. 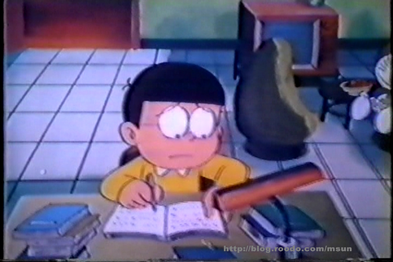 Nobita trying to do his homework. Doraemon meets the weird professor and an evil robot. The main characters looking upset. 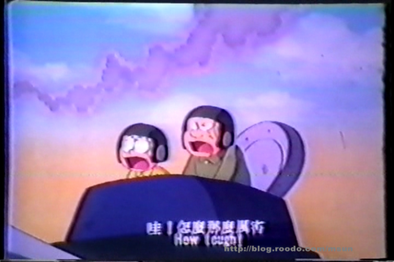 Nobita and Gian looking at something. 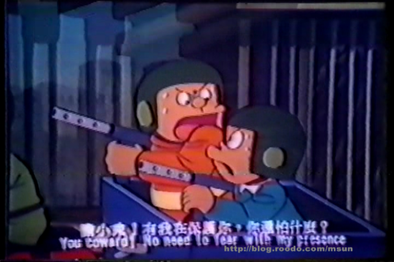 Gian and Suneo shooting at something (presumably the robot). An archived blog post about the film. English translations of existing information from the Chinese sites. Untranslated archive of the original post showing the images. Post on doracity with more newspaper clippings on the film. The Wikipedia page on the studio. Info on the studio behind the film. Ending Clip of the movie.